(15/P27) TRENTON –The New Jersey Division of Fish and Wildlife and a coalition of nonprofit groups are calling on volunteers to help out with this spring’s “reTURN the Favor” initiative, a fledgling effort that is saving tens of thousands of stranded horseshoe crabs whose eggs provide a critical food link in a globally unique shorebird annual migration through Delaware Bay. Some 500 volunteers fanned out across beaches last spring, rescuing nearly 32,000 horseshoe crabs and returning them to the bay, building on the 5,000 horseshoe crabs rescued in 2013, the effort’s inaugural year. The initiative hopes to keep building on these impressive numbers by encouraging even more volunteers and groups to take part in the upcoming effort, which starts around mid-April and tapers off in mid-July. “For years New Jersey has taken the lead in research and conservation efforts for preserving a globally unique phenomenon – the annual migration of red knots and other shorebirds that depend on eating the protein-rich eggs that horseshoe crabs lay on bay beaches during their migrations to breeding grounds,” said David Jenkins, Chief of the DEP’s Endangered and Nongame Species Program. “The volunteers are now providing a new and critical element to these efforts, saving tens of thousands of horseshoe crabs and giving them a chance to help sustain the following year’s shorebird migration, at the same time fostering stewardship and education for the general public,” added Endangered and Nongame Species Program Principal Zoologist Amanda Dey. Horseshoe crabs numbers have been significantly impacted by commercial harvesting, leading to a harvest ban in New Jersey. The slow-moving, helmet-shaped creatures are easily flipped over by waves and left stranded. They also get trapped behind bulkheads and other shore protection structures. Volunteers return these to the bay. One species of shorebird – the red knot – has also sustained significant declines in recent years, and must migrate as much as 10,000 miles to its breeding grounds in the Canadian Arctic. The weight these and other shorebirds gain during the Delaware Bay stopover is critical for survival because this is the last stop before red knots reach still-frozen arctic breeding grounds. 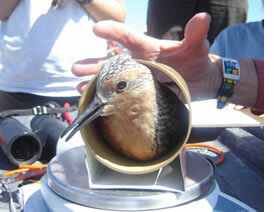 The fat reserves put on in Delaware Bay allow red knots to survive and continue courtship, mating and egg-laying until food becomes available. The reTURN the Favor effort is supported by the New Jersey Division of Fish and Wildlife. Partners include the Wetlands Institute, the Conserve Wildlife Foundation of New Jersey, Celebrate Delaware Bay, the New Jersey Audubon Society, the Bayshore Center at Bivalve, Citizens United to Protect the Maurice River, Friends of the Cape May National Wildlife Refuge, The Nature Conservancy and the Western Hemisphere Shorebird Reserve Network. 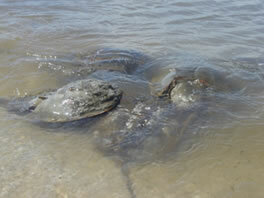 “The reTURN the Favor effort has developed into a rewarding and impactful program for all involved by providing a simple way for volunteers and conservation organizations to join together and carefully rescue horseshoe crabs from our beaches without causing harm to other resources,” said Lisa Ferguson, Director of Research and Conservation at The Wetlands Institute. About 74 percent of the crabs rescued last spring were stranded because of wave action. An additional 22 percent were rescued from hazards such as rubble, bulkheads, rip-rap, or debris. Four percent were caught up in marsh grasses or peat outcroppings. Compared with its inaugural 2013 season, reTURN the Favor's 2014 efforts grew substantially. It rescued six times the number of crabs saved in 2013, conducted five times the number of walks, and involved three times the number of volunteers. Data collected from the rescue program will be used to target small beach cleanups as well as future beach restoration efforts to improve the spawning habitat of horseshoe crabs. Visitors to Delaware Bay beaches during horseshoe crab spawning season are advised to avoid walking on the beach when shorebirds are present and to keep dogs leashed. Adhere to beach closures and use designated viewing areas for watching shorebirds and study them from a distance with binoculars or a spotting scope.